Conservation Districts provide many technical services to their towns and cities including site visits, site plan reviews and other on-site investigations. 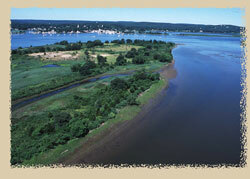 We specialize in soil erosion and sediment control plan review. We often assist municipalities with water quality, wetland and stormwater issues as well as associated environmental impacts. For large or complicated land use changes, your local Conservation District can help your town apply for an ERT Report prepared by a diverse team of experts statewide. This free service is funded in part by the Conservation Fund administered by the Connecticut DEP. Due to Connecticut’s system of home rule and the lack of any county or regional level of government, key land use decisions are made on the local level. This means that the volunteer members of Planning & Zoning, Inland Wetlands or Conservation Commissions play an important role in shaping the future landscape of their community. We provide high quality technical training programs geared to municipal land use staff and commission members. 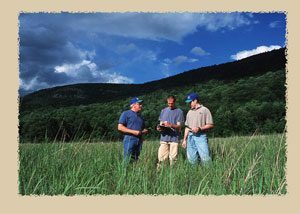 It is our goal to provide these individuals who make the important land use decisions with the best information and tools possible. As key partners with the Federal Environmental Protection Agency (EPA) and the Connecticut Department of Environmental Protection (DEP), Conservation Districts are involved in many on the ground projects statewide resulting in cleaner waterways. Many of these projects are funded in part by Section 319 of the Federal Clean Water Act, and address non-point source or agricultural pollution. Visit your local District to find out what’s happening in your watershed. Districts also conduct public informational campaigns aimed at fostering a sense of land stewardship among local citizens. Each of us can do a lot for water quality by simple actions in our daily lives. Your local Conservation District is a valuable source of information and referrals on a wide range of environmental topics. We are knowledgeable and well connected to the statewide network of federal, state and local environmental service providers. District staff can answer your question or refer you to the right agency. We can untangle the often complicated web of jargon and procedures to find answers for your environmental needs. Your Conservation District office is a resource center offering USGS Topographical Maps and a variety of books, journals, pamphlets, fact sheets, videos and many free resources for the public. Assist municipalities and private groups to preserve open space by providing information, education and technical advice. Promote sound agricultural practices to prevent erosion of fragile soil resources and pollution of precious water resources. Advise farmers and help them find funding for building manure management and other structures. Conduct June Nitrate Testing for farmers who want to avoid using excess nutrients. Recognize local farmers with the “Conservation Farmer of the Year” Award for their efforts in environmentally sustainable agriculture. Help farmers who are interested in preserving their land through the state’s Purchase of Development Rights Program. Raise public awareness and to promote Farmland Preservation in partnership with Land Trusts and many other advocacy groups. Educate the public and students about the crisis situation in Connecticut. According to Working Lands Alliance, we are losing farmland at a dramatic rate. Between 1992 and 1997 the state lost an average of 8,000 acres per year to non-agricultural uses. If the current rate of loss continues, Connecticut will have no farmland left by the middle of this century. The Southwest Conservation District manure share program is a free, public service in concert with the Natural Resource Conservation Service to facilitate the recycling of valuable nutrients and organic matter from livestock waste. The program offers many benefits as a link between livestock owners and gardeners or professional landscapers! By connecting these two groups we hope to alleviate the pressure and cost on livestock owners of disposing of excess manure/compost while also providing a valuable resource for the public to utilize. Of course, the environment also wins by reducing the usage of store bought fertilizers and potentially improving water quality near the manure sources by reducing excess material running off into local water sources. If you have Manure that you’re looking to get rid of, click the button below to fill out our form and be entered into our manure share database. If you are looking to acquire Manure from our cooperators please click the link below to access our manure share database and search what is available. -Understand what you are looking for and what the farms have available. There is a big difference between looking for fresh manure to compost on your own and already composted manure that is ready to be spread. -Ask questions! Besides being either fresh or fully composted, farmers will likely have manure in numerous states of maturity. Ask the farmer what they have available and communicate what you are looking for. -Even if the manure is fully or almost fully composted it is recommended to cover the manure and let it continue to compost for at least a month. This will help destroy any remaining weed seeds in the pile and prevent them from spreading to your target location. -Be prepared in advance! Do you have a pick up truck available to transport the manure? Are you going to be continuing the composting process at your property? Do you have a suitable area to do that in? Do you understand what that process will entail? The links below may be helpful in answering some of these questions.